TeamSupport has native integration with Zoho CRM so that company, contact and product information can by synced from your Zoho account into your TeamSupport account, and ticket information can be sent back to Zoho. This integration allows your company to use best of breed solutions for sales, marketing and contact management as well as customer service and support! !Important Note: After June 30, 2012 the Zoho API Key, that has been used until now, will no longer allow users to connect to Zoho CRM. Because of this, all our Zoho CRM users are required to generate and save in the TeamSupport Integration Settings page the new Zoho CRM Authentication Token as directed in the following instructions. For more details regarding this change visit Zoho’s authentication token introduction page. 1. Build the token generation URL replacing in the following string the and with the Zoho CRM username or eMail Id and the Zoho CRM password respectively. 2. On an internet browser window copy and paste the token generation URL and press Enter. 3. Copy the authentication token. The “Account type to link to TeamSupport” field allows you to select the Account Types you will use in Zoho CRM to mark which companies you want brought over to your TeamSupport account. Generally people use “Customer”, but you can change this to whatever you want. Please note that capitalization does matter here, so “customer” is not the same as “Customer”. You can also identify more than one Account Type by using a comma to separate them as shown above. You can also put in the word “NONE” (no quotes) and we will import all accounts/contacts that have no account type defined in your CRM. 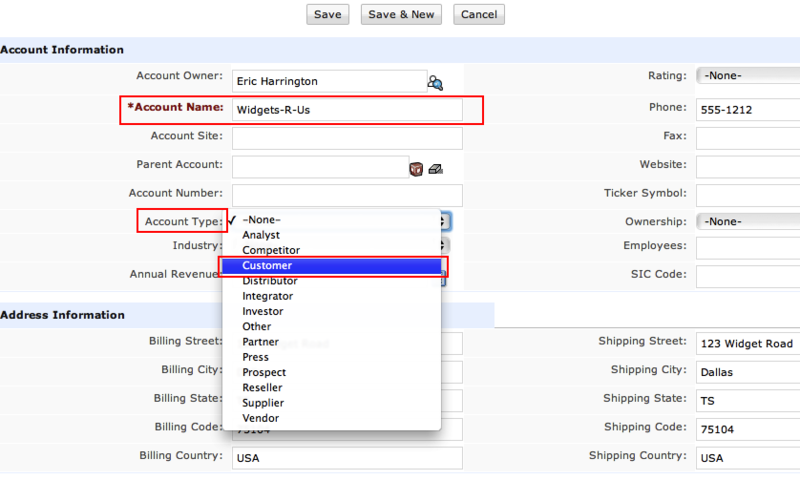 This option will bring the products associated with each account. If the product is found already associated with the account no change will be made. If the product is missing in the list of associated products, it will be added to the customer products. If the product to be added does not exist in the list of products in TeamSupport it will be added in this list also. The products that are not associated to the accounts being imported will not be included in the TeamSupport products list. Once you’ve followed the steps above, your integration should be active. Now you can go into Zoho CRM and edit the accounts you would like to sync. The integration runs every 15 minutes, 24/7 so you will not see instant results. Your customers and contacts will begin to appear under the Customer section within your TeamSupport account. 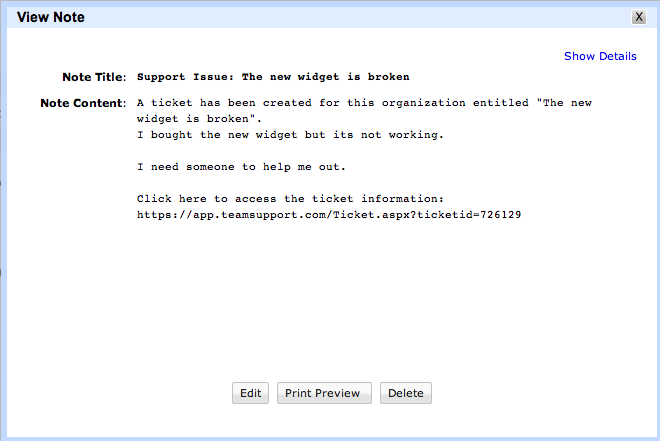 When a ticket is created by your customers, you will see this as a note in Zoho. See below. 1. Company, Contact and Product information is only synced from Zoho CRM to TeamSupport, not the other way around. If a change is made to a linked contact in TeamSupport, it will be wiped out the next time the integration service runs. We suggesting using your CRM as the main source for contant info. 2. In order for a contact to be brought over into TeamSupport, they must have a valid email address defined within Zoho CRM. 4. Customers can take 15 minutes to show up so once you setup the integration, be patient. After 15 minutes, refresh TeamSupport and you should see the customers begin to appear. Your TeamSupport account will run 24/7/365 scanning for updates. So the next time you go to the customer section in TeamSupport, your Zoho CRM customers should be there. You can also reference a report called CRM Sync Logs within the Reports section of your account to see recent activity. You can also map fields between Zoho and TeamSupport. The field mapping is between Accounts in Zoho with Companies in TeamSupport, and Contacts in Zoho with Contacts in TeamSupport. Simply choose the Mapping Type (Account or Contact), then enter the Zoho field name, then enter the TeamSupport field you wish to map to. As a best practice, if you are syncing a pick list, make sure both lists are the same, this way if you change a value in Zoho, the correct one will be chosen in TeamSupport. As always, if you have any problems or need help with the integration, please email support@teamsupport.com or give us a call at 800.596.2820.